Like every over scheduled adult in America, I love coffee. Start a day without a cuppa? Not gonna happen. I wasn't always this way. Until a few years ago, I shunned the brown brew in favor of diet soda. But last summer was a scorcher - I regularly roused myself at 4 a.m. to complete my long runs before the pavement liquefied the soles of my shoes. I decided one afternoon to reward myself for a hard day of training with an positively sinfully cold iced coffee. It was pure magic - potently strong and refreshingly cold. I was hooked. Now, I rarely skip the opportunity to grab a cup (as you well know after reading my travel recaps from San Francisco and Austin). 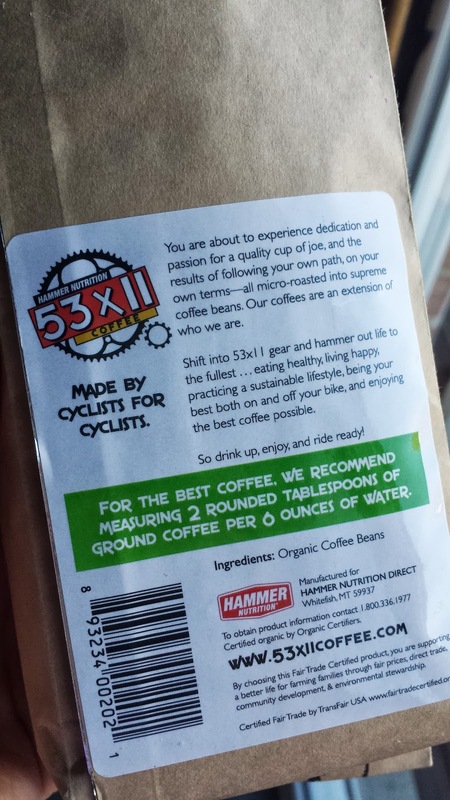 I'm always looking for a new brew, so when I saw information about 53x11 in a race packet, I had to know more. This coffee is different. 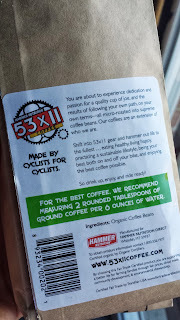 It's fair-trade coffee made for cyclist (hence the name) on sustainable, organic farms. It may sound weird, but show me an athlete that doesn't drink coffee and I'll show you an athlete who lies about more than just their finish times. 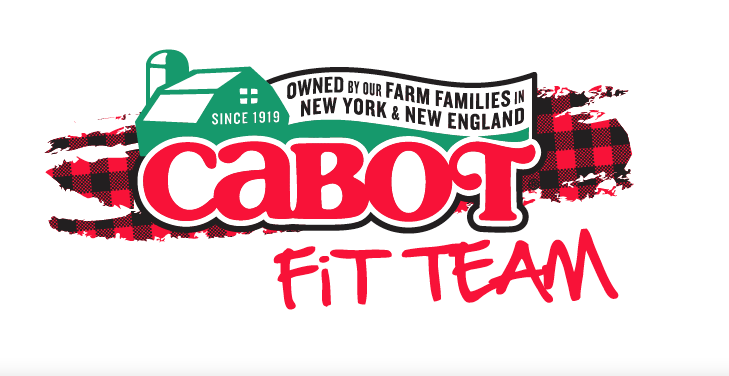 It's also affiliated with Hammer Nutrition, which was the provider of the on-course nutrition for my 70.3 tri in Michigan this weekend. Anyhow, back to the brew. 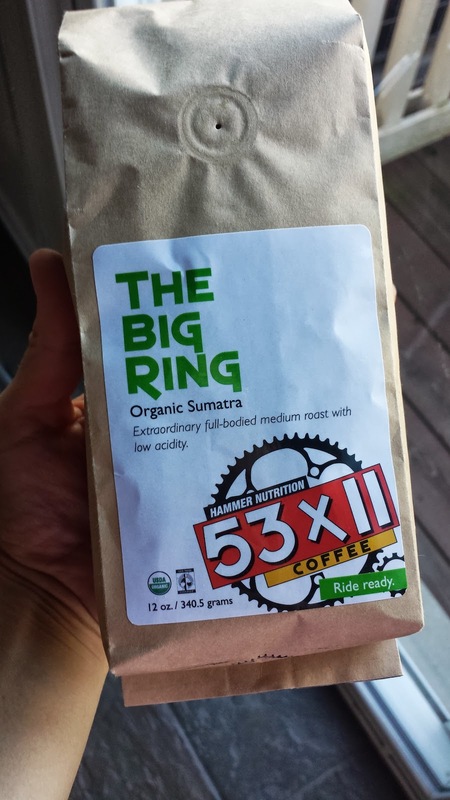 The company sent me its Big Ring blend, which is a Sumatra blend grown in Indonesia. I received a bag of whole beans and could tell the difference in quality immediately upon opening the bag. It smelled much more complex than your regular grocery story variety of beans, and the beans were actually darker, too. And a coffee made by a pair of dudes committed to quality makes a huge difference in the final brew. I enjoyed a cup with my favorite furry companion before heading out on a ride. If you want to try this premium coffee, today's your lucky day. 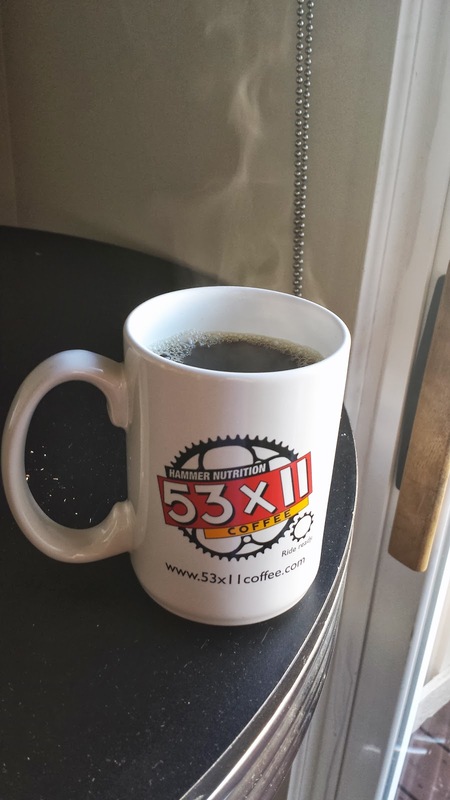 53x11 provided me with one bag of The Big Ring, along with a coffee mug and pour over kit for one lucky reader. One winner will be selected next week and announced here, so enter the RaffleCopter giveaway below now! I believe you because I know you're honest. I mean, anyone who loves cats and T-Rex simultaneously cannot lie. Fact. I like my coffee hot and black. I have pretty simple tastes. I go through coffee phases - sometimes I gotta have it and sometimes I'm OK without. Now is a gotta have it time! I prefer iced coffee with stevia and almond milk and I HAVE to start my day with a cup. I love coffee! I like hot coffee with a splash of almond milk and cinnamon in the AM - the bigger the better! 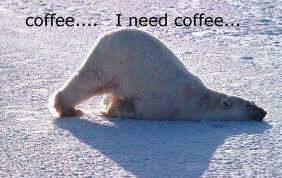 I want coffee right now! It's rainy here and it's never rainy. I love coffee! Right now I'm drinking a lot of blonde roast from Starbucks. Would love to break out of the rut. Dark roasted with cream and sugar! Plus, how hard is it to order coffee now.... latte mocha grande, expresso shot with skimmed milk - will I even like that???? I prefer iced coffee but this sound delicious. This coffee sounds really interesting, and I love the name! I take my coffee with cream and sugar for the most part, but if I get a flavored (already sweetened) coffee from Dunkin Donuts I just get cream. And I love iced coffee most of the time! Every once in awhile a nice cold iced coffee is so yummy! Coffee! Black! Every once in awhile I like an iced coffee! I take my coffee with way to much creamer. I like my coffee with a lot of cream and no sugar! I take mine with caramel creamer.